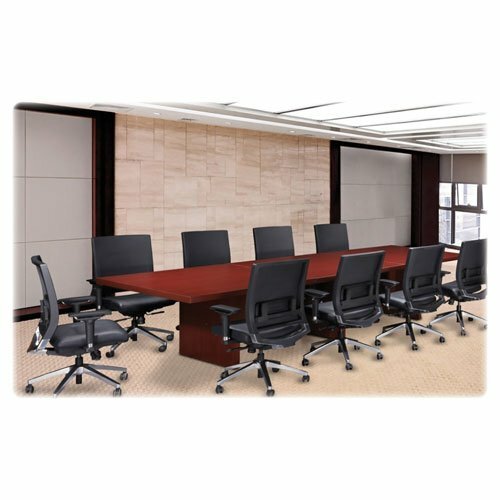 Modular Conference Table offers a stylish versatility, sturdy construction and easy cord management for your meetings with 2\ heavy-duty tops and 3-1/4\" grommets in tops and adder sections. High-quality Cherry laminate matches any office decor and offers a durable surface to last for years. Components of Lorell Prominence Infinite Length Conference Tables are sold separately so you can mix and match for the perfect table in your conference room. You can attach an adder section (sold separately) to your starter tabletop to expand the conference table or just a matching modesty panel, straight end base and/or curved base (all sold separately) to complete it. Modesty panels are required on all length tables. All tables 12' or longer require curved bases at both ends for stability."